Blogger’s Day at Wendy’s! And I Love the New Pick 2! There is such a thing as healthy FAST FOOD! I had the opportunity to attend a Bloggers Day at Wendy’s on Howell Mill Road in Atlanta with a group of funny, witty and wonderful moms and their friends and little tots in tow. We all sat down to try Wendy’s new Pick 2 menu of four half-sized Wendy’s salads, along with one of seven additional menu options. 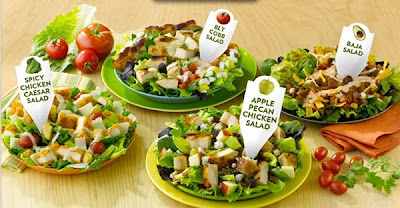 The choices were: Spicy chicken Caesar, Baja Salad, BLT Cobb Salad, and Apple Pecan Chicken Salad. I chose the Spicy Chicken Caesar. My motto is “Go Hot or Go Home!” And for a side I chose the baked potato simply because I absolutely LOVE Wendy’s baked potatoes with butter and sour cream anyways. Other options included chilli or even a junior bacon cheeseburger, or a frosty or fries. Well, I am trying to lose weight and I figured I’d better stay on the healthier side of life and go with the salad option to better assist me in my weight loss. Well, I can say that the spicy chicken did not disappoint! My Oh my! I was given lemon garlic caesar dressing and it was simply delish drizzled over my leafy greens. What I love is that the portion is small but it’s just enough to fill you up. You know you CAN overeat even on a salad. I checked and the Zensation Salad at Zaxby’s ALONE is over 800 calories! That’s a no-no! The Pick 2 option offers 28 total combinations of menu items, and 18 of those combinations are 600 calories or less! All of them combine fruits, vegetables, nuts, dairy and proteins. The Pick 2 menu meal option is just $4.99 or the new half-sized salads are also available as a stand-alone menu item for $3.99. I consider this to be a best-buy, especially for me, a mom of FIVE. It’s VERY affordable. I was truly full after eating my Wendy’s half-size salad and baked potato. I was full and happy I didn’t over do it. I also had a strawberry lemonade from a new very fancy coke machine that I have never seen anywhere else. They had all kinds of mixtures of drinks in there! For those of you who are trying to lose weight and eat right and you often EAT-OUT, then stop by Wendy’s and take your pick of some really good salads. I have crowned this week Wendy’s Week because I need to return all week to try all the other salads! 3. Comment on any post and state that you are following me! And if you don’t have a blog, don’t worry! you can enter by simply doing number 4 FOUR TIMES! I will see each tweet and you are automatically entered! Good luck and good eating! Giveaway: My Milan Loves Her Mabel’s Labels! Kia, it was great meeting you today! I'm so glad Meghan invited me to join you all!